01. 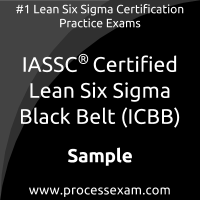 Much of the Six Sigma methodology is used to identify and remove causes for _____________ . 02. Control charts and their limits are the? 04. In a Fishbone Diagram the 6M’s stand for Methods, ____________, Machine, Man, Mother Nature and Materials. 05. For a process having an average throughput of 7,200 units per hour, what is the average Cycle Time per unit in seconds? 06. Appropriate measures means that measurements are ______________. 08. An operator is measuring the distance between two points. Which is most likely to be influenced by the operator? 09. Cost of Poor Quality (COPQ) can be classified as Visible Costs and Hidden Costs. Which of these items is a Visible Cost? 10. A two-sample T-test does which of the following?